Guyana is often referred to as the Land of Six Peoples and the Land of Many Waters. Six peoples because our nation is made up of Africans, Indians, Portuguese, Chinese, Indigenous and the ever growing mixed race of which I am. It is fondly known as the Land of Many Waters due to it numerous rivers, the largest being the mighty Essequibo river. Well, today this shapely country, (if you doubt it’s shapely, check out the map here ) :) the land of my birth, is celebrating 41 years of Independence. In honour of this occasion, in this week’s column, I decided to make two of our national dishes which, for me, personify who we are as Guyanese. Cook-Up Rice is a must-have dish on Saturdays. Cook-up as we call it, is a one-pot dish that consists of peas, rice and various meats – fresh and cured - that is cooked with coconut milk and fresh herbs. Cook-up rice is also a traditional Old Year’s Night (New Year’s Eve to some of you) meal. The variety of ingredients in this dish, I feel, exemplifies the make-up of Guyana. We like to serve this dish with fried fish, fried ripe plantains and a simple salad. Another national dish we have is called Pepperpot. 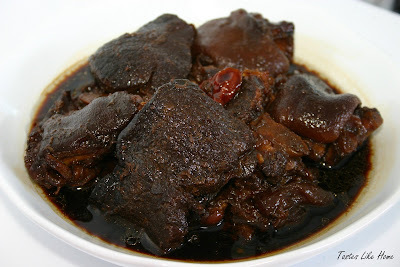 While Pepperpot can be eaten all year round, it is traditionally made and eaten at Christmas. Breakfast on Christmas morning would just not be breakfast without Pepperpot and bread, preferably homemade. In Guyana, the Indigenous peoples are Amerindians and it is they that we have to thank for this unique, flavourful creation. The key to excellent Pepperpot lies in good quality casreep. Casreep is a thick syrup that is obtained from boiled cassava juice. This flavourful syrup is used in many sauces and as flavourings in some dishes. I have some Trinidadian friends who L-O-V-E our casreep. They use it in place of burnt sugar to colour some of their dishes. To make Pepperpot you need some ingredients that may seem strange to some of you J - cow-heel, pig trotters and more familiar, beef. The other ingredients are flavourings: casreep, cinnamon, cloves, ginger, scotch bonnet pepper, dried orange or lemon peel, salt, sugar and water. The ingredients are put in a large pot and set on a roaring fire to cook for at least 1 hour. Pepperpot tastes best the day(s) after it is made. It is eaten with bread that sops up the sweet-like sauce. Pepperpot lasts for days without refrigeration; this is done by reheating it twice a day to a boil. At each reheating, the flavours are further enriched. So why make a traditional Christmas dish at Independence? Because I can :) more seriously, I made it because I wanted to salute and acknowledge our Indigenous heritage that makes Guyana such a special place. 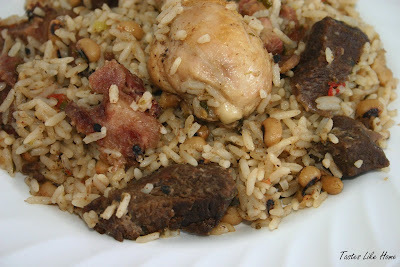 Please email me if you’d like the recipe for either of the dishes: Cook-up rice or Pepperpot. I did not put them here because they would have made this post even longer. This week’s column can be read here. Many of you out there have spouses, relatives and friends who are there, close by, to taste your creations, experiement on, and give feedback all the time. Me? I have my best friend Susan, as my family and relatives live in another country. She is my foodie sidekick. Susan has created a blog, Foodie Sidekick, where those (spouses, partners, relatives & friends) who are at the receiving end of a foodie's creative, obsessive, compulsive, mad and delicious creations can gather, discuss and exchange among themselves the things we do in the name of food blogging, the tastes, the tantrums, the triumphs etc. Here, let her tell you in her own words what the blog is all about. "Are you now or have you ever been a Foodie Sidekick? Have you ever knowingly associated with Foodie Sidekicks? I hope so. Just like Batman had his Robin and Superman had his Krypto every foodie has one, two, three or more sidekicks. We are the people who have the pleasure of watching the foodies create glorious gastronomic delights. We are the people who have the delectable duty to taste those culinary creations. Whilst happily eating one of Cynthia’s wonderful meals I had the idea to start the Foodie Sidekick. The Foodie Sidekick is a place for all the foodie sidekicks to gather and let the world know just how all these wonderful dishes actually taste. Let you’re foodie sidekicks know that finally they have their own gathering space to talk about one of the most important aspects of food – eating it. Now, be very clear, you’re probably a foodie – that’s why you’re reading this here, but you can be a foodie and a foodie sidekick too. Come to Foodie Sidekick, take the test and see if you too are a Foodie Sidekick.!" Susan.